If you've been following along on this blog, you'll know that I attended Left Coast Crime here in Phoenix last week. It was the first time I'd ever attended anything like this, and it turned out to be a major decision. Number one, it's not free. The price varies depending upon when you sign up. Number two, I'm an introvert who passionately dislikes crowds. Number three, my knees work when and if they want to. Number four, parking. Two of the decisions I made prior to going were to take cabs and to bring my cane. The only time I'd ever been in a cab was in London, so this was basically new and scary territory for me. I'm always early everywhere I go-- always have been-- so giving someone else control over my arrival times made me nervous. Fortunately I seemed to have chosen the right taxi company to get there in the mornings, so that was some stress removed, and little did I know how helpful my cane would be once I'd gotten used to having it with me all the time. Everyone's selection was different, and there was a swap table on the other side of the atrium for those who wanted to improve their selections. Another important thing to do at the registration table was to select the author's table you wanted to be seated at for the awards banquet on Saturday night. Which one did I choose? The table with Paige Shelton, Jenn McKinlay, and Kate Carlisle. 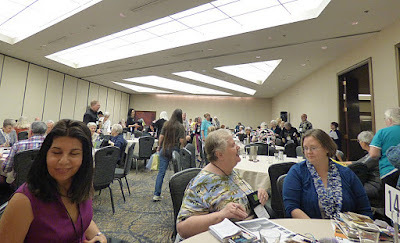 Immediately after registering, Kay and I dashed-- well, she dashed and I did a quick hobble-- to the Author Speed Dating event. Wow! The photo above doesn't even begin to capture the manic uproar this event was. Eighteen tables, forty authors. The authors were in pairs and went from table to table. Each one spoke for two minutes about themselves and their books-- and handed out TONS of free stuff. 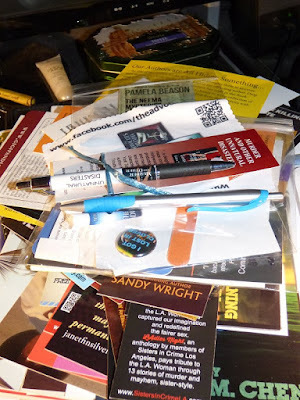 The next photo gives you an idea of the mountain of stuff I had to cram in my Left Coast Crime bag amongst all those books! The din from everyone trying to be heard over everyone else was enough to make my ears ring, and I have to admit that there was a couple of times that I couldn't hear the author speaking at my table over another with better volume at a nearby table. The vast majority of freebies were business cards and bookmarks, and I came to the conclusion early on that I would put an asterisk on the bookmark of any new author whose books I wanted to read. 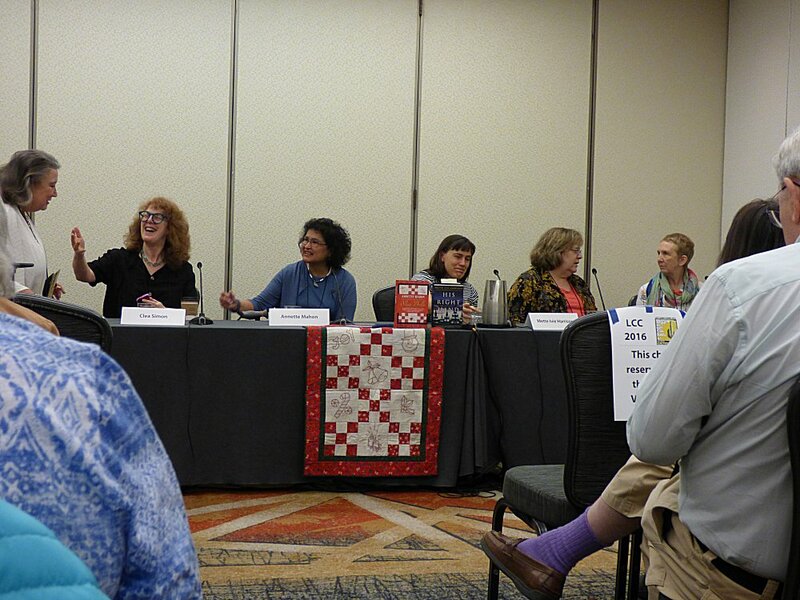 Yes, this was a time to learn about lots of new authors, but it was also an opportunity to tell favorite authors making the rounds how much I enjoyed their books-- and to let the other people at my table know how good their writing was! 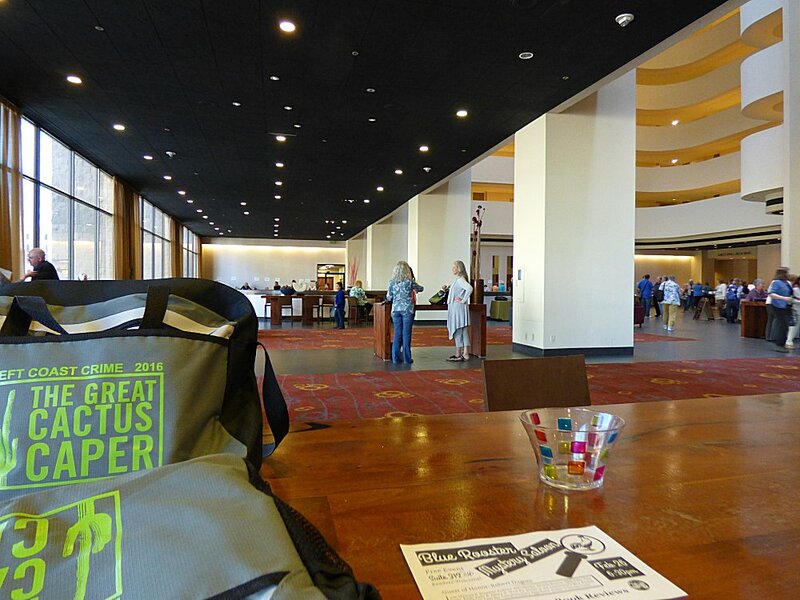 After that managed chaos, Kay and I needed some peace and quiet-- and the chance to talk about what we'd already experienced, so we headed downstairs at the Hyatt Regency to the Networking bar and restaurant for an early lunch. Rejuvenated, we headed our separate ways for our first panels. 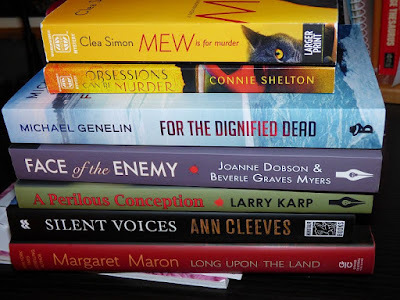 Mine was called Murder on the Books: Mysteries Involving Books. The participants were (L to R) Kristin Eckhardt, Linda Wiken (AKA Erika Chase), R. Franklin James, and Victoria Abbott (AKA Mary Jane Maffini). Linda Wiken started out by writing romance but soon discovered that she had more fun murdering people. At one time she and co-panelist Mary Jane Maffini bought their favorite mystery bookstore so it wouldn't close. James admitted that she was "a fierce eavesdropper. That's where I get a lot of my story ideas. Like the woman on the train whose daughter wore size ten shoes, but the woman would only buy her size 9½-- and then she'd take the shoes to the shop to have them stretched. You can't make this stuff up!" 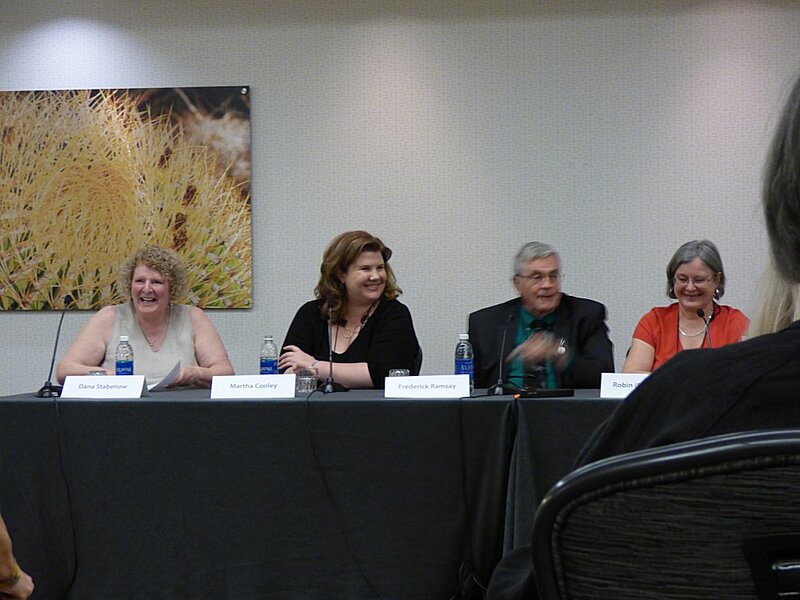 My next panel was Big Fish in a Small Pond: Big-city sleuths tackle small-town murder. The participants were (L to R) Dana Stabenow, Martha Cooley, Frederick Ramsay, and R.J. Harlick. 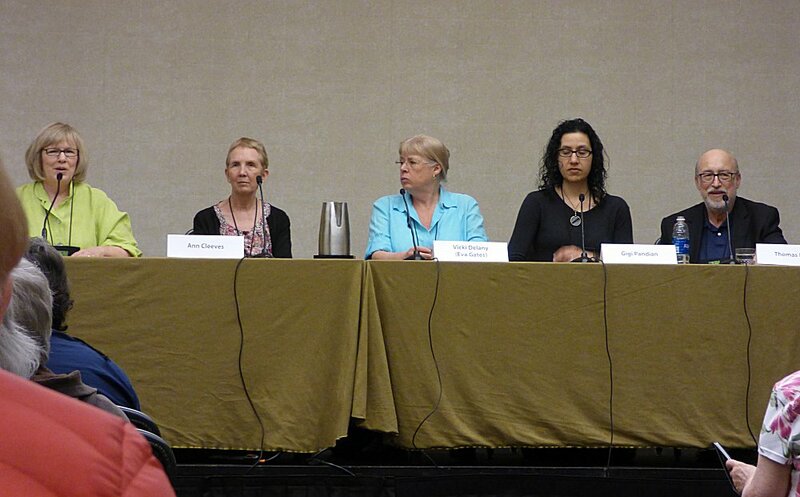 Since they were one panelist short, Dana spied Laurie R. King coming in and quickly added her to the lineup. At one point, Dana referred to Laurie as Laurie's main character Mary. When Laurie objected, Dana retorted, "Cut me some slack-- people call me Kate all the time!" King did have an observation to make about Stabenow's presence on the panel: "How does Alaska qualify as a 'small pond'?" Dana laughed and said that it must have something to do with the small population in such a large area. Stabenow told us that she has an iPhone, an iPad, and a MacBook Air. She set up shortcuts not realizing that those shortcuts and any corrections she made would translate across all platforms. (In other words, if she corrected something or set up a shortcut on her iPhone, it would automatically show up on her iPad and MacBook Air.) When she fired up her laptop to work on her manuscript, she couldn't figure out what was going on: every time the word "sea" was used, it had been changed to "Seattle" (she'd put in SEA as the abbreviation for Seattle-Tacoma Airport.) "By the Shores of the Middle Seattle" just doesn't have the same ring to it as By the Shores of the Middle Sea! Ramsay was asked about his series that is set in Jerusalem during the time of Christ. He quipped, "The farther back you go you can make your own rules. I'm going to do a Caveman series next!" 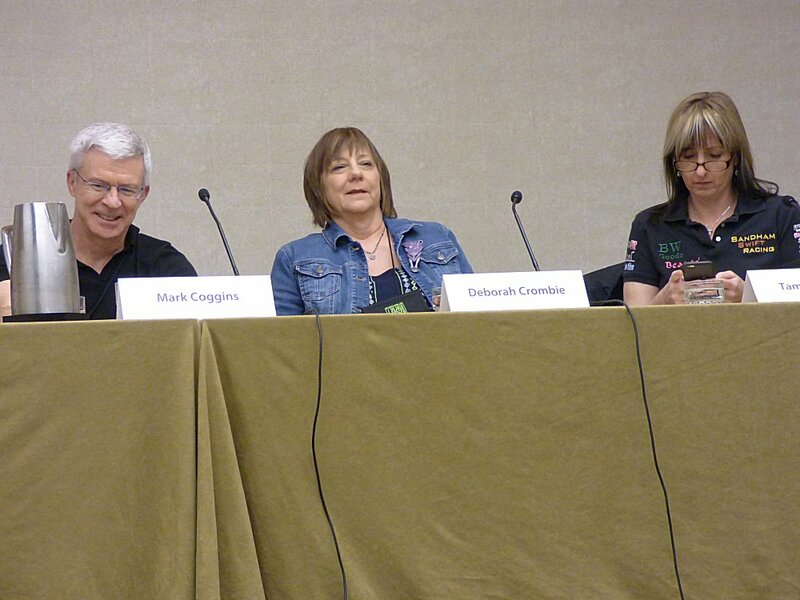 This was such a fun panel, but it was time for me to head to the next one: Juggling Multiple Series. The participants were (L to R) Kate Carlisle, Ann Cleeves, Vicki Delany, Gigi Pandian, and Thomas Perry. There were two added bonuses for this panel: they were seated on a dais, which made them easier to see, and I was seated next to author Paige Shelton. 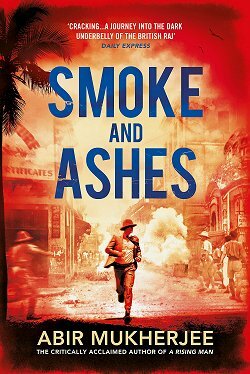 Carlisle said that she'd been stuck in one of the books she's writing, and she remembered that Raymond Chandler had once said, "When you're stuck, have a man holding a gun burst through the door." Ann Cleeves said, "I don't do guns as a rule, but I did try once-- and in walked Vera fully formed." I heard many sighs throughout the room (even from the panelists). What a magic moment that had to have been to have such a marvelous character just... appear! Thomas Perry said, "There was ten years between the first and second Butcher Boy novels, and twenty years between the second and third. Book four is due in forty years!" He also shared something a fan sent in an email: "There hasn't been a new Jane book in nine years. Are you retired, or did you die?" After telling us that place is at the heart of what she does, Cleeves said, "The hardest thing is to know when to stop, and I'm arriving at that point with the Shetland books"-- to groans from the audience. 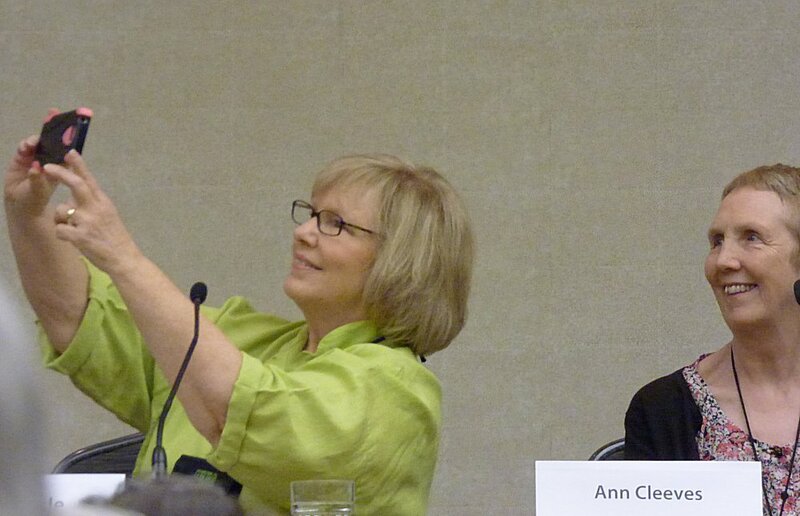 Kate Carlisle taking a selfie with Ann Cleeves. That was the end of Day One, and I was exhausted. Kay and I met in the atrium for a recap, and I learned that she was tired, too-- more to do with being overloaded on emotional stimuli than anything else. What a buzz to meet so many of our favorite authors! We both decided that we weren't going to attend panels unless we were passionate about them, which meant that we should have a bit of down time here and there to relax and explore other things during the convention. My first panel on Friday was probably the most profound of the entire convention: Genre Hopping: Authors writing multiple genres. Chris Goff writes a birding series, but when her daughter became gravely ill, she found herself taking her daughter to Israel for specialized medical treatment. 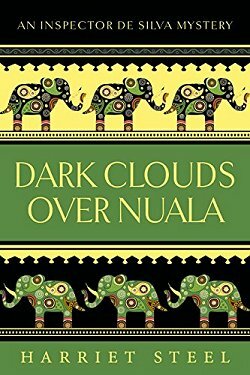 While there she was inspired to write Dark Waters, a novel about the Arab-Israeli conflict. 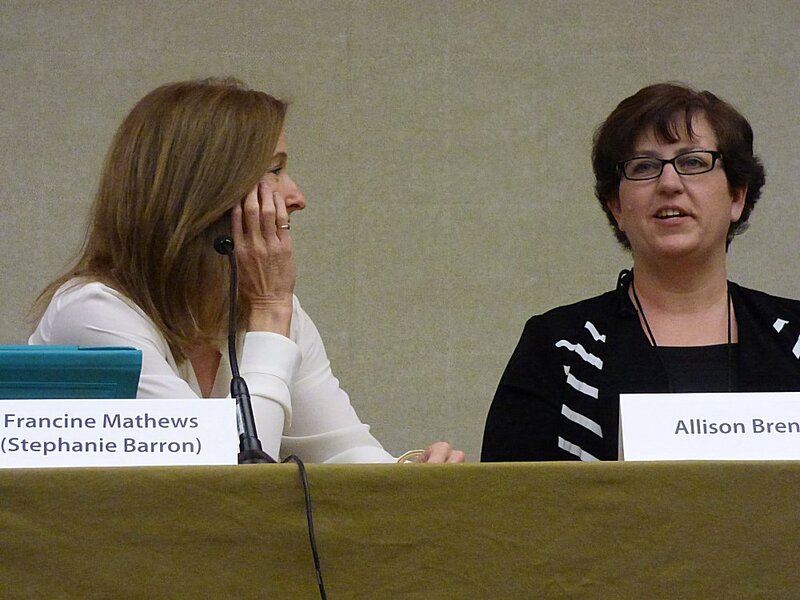 Being so open about her own frightening experiences with her daughter helped Mette Ivie Harrison open up about her experiences writing her Linda Walheim mysteries. Mette had to fire her agent who'd insisted that she not write The Bishop's Wife. ("That made me braver than I'd ever been before.") Her father-in-law is pressuring her son to go on a mission for the Mormon Church, and-- due especially to the issues she brings up in her second book His Right Hand-- she fears excommunication daily. This is a woman who has truly suffered for writing something that she believes in with all her heart and soul. After an emotion-filled pause, Mette said, "If I knew what would happen, I don't think I would've written these books." I don't think there was a single person in that room who didn't want to wrap her in a hug. I was (and still am) upset. I lived in Provo, Utah for three years, and after reading her two mysteries, I honestly couldn't see how she could escape some dire consequences. We may have free speech in this country, but many times it comes at a very high price. After that panel, I was feeling very emotional, but it was time to go to my next panel, Cherchez La Femme, Women Overturning the Stereotype: Strong female sleuths as role models. I had to take two photos to get the entire panel in. Starting with the first photo and moving clockwise through the second, the participants were Francine Mathews (AKA Stephanie Barron), Allison Brennan, Mark Coggins, Deborah Crombie, and Tammy Kaehler. 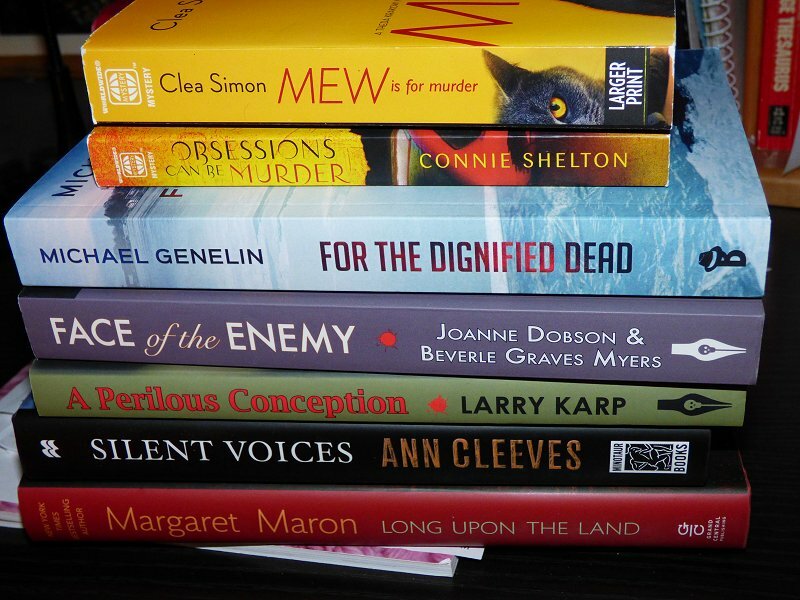 I love Francine Mathews' historical thrillers, and she was the first moderator I saw using an iPad. Although the entire panel was interesting, the thing I remember most about it was the other authors' complaints about the tough questions Mathews asked. I had to laugh-- those questions showed Mathews' skill as a CIA analyst (the career she had before becoming a writer)! 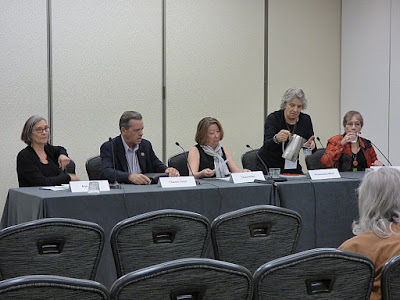 The next panel was Historical: Turn of the Twentieth Century. 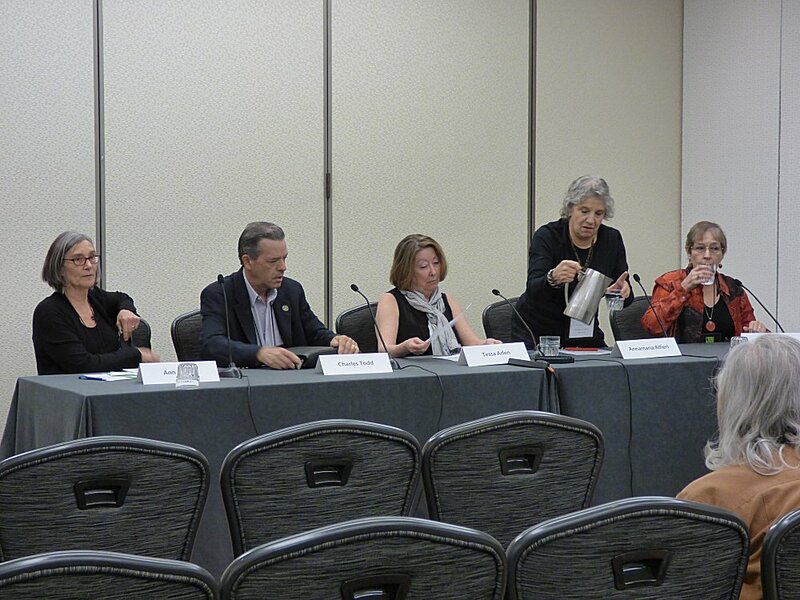 The participants were (L to R) Ann Parker, Charles Todd, Tessa Arlen, Annamaria Alfieri, and Donis Casey. Another fascinating panel, but the thing that stuck in my mind the most was what inspired Donis Casey to set her wonderful Alafair Tucker series in Oklahoma. She was on a flight to Ireland when a person asked her where she was from. She replied, "Tulsa, Oklahoma." The person looked at her and-- very condescendingly-- said, "What a place to be from!" Donis didn't take that very well, but didn't let it show. Instead she asked the person where he was from. "Teaneck, New Jersey" was the proud response. "What a place to be from!" was Donis's silent reply! Even though Kay and I had decided not to attend every panel possible just for the sake of attending, my day had still been filled with them-- and I'd enjoyed every one. 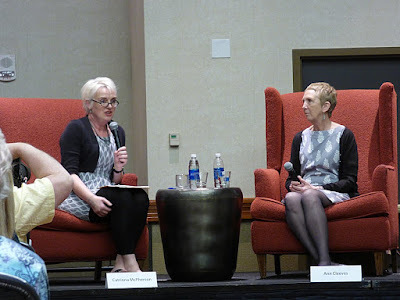 There was only one thing left before taking a taxi home: Left Coast Crime Toastmaster Catriona McPherson was interviewing the International Guest of Honor, Ann Cleeves in the Regency Ballroom! Hyatt Regency Atrium where I took a break here and there. McPherson has a Scottish accent I could listen to all day, and she is riotously funny. Ann is quiet and reserved, but she can be quite funny, too. Ann is quite passionate about libraries, and The Glass Room has been written as a murder mystery for libraries to put on, complete with scripts, posters, and other necessities. Cleeves said that any interested parties should contact her through her website. When McPherson said that Cleeves was going to be giving away a chance to have a character named after the winner in her next book for the live auction during the awards banquet Saturday night, Cleeves said that she'd done that before, and the winner had a very unusual Polish name-- which gave her fits when trying to fit the character into her book Harbor Street. Ann goes to Shetland three or four times a year. The population of the islands is roughly 22,000, "and I've killed off quite a few of them!" She loves to travel and was the second author in two days to list Andrea Camilleri as someone whose books she loves to read. I'll end this incredibly long post on a note of serendipity. 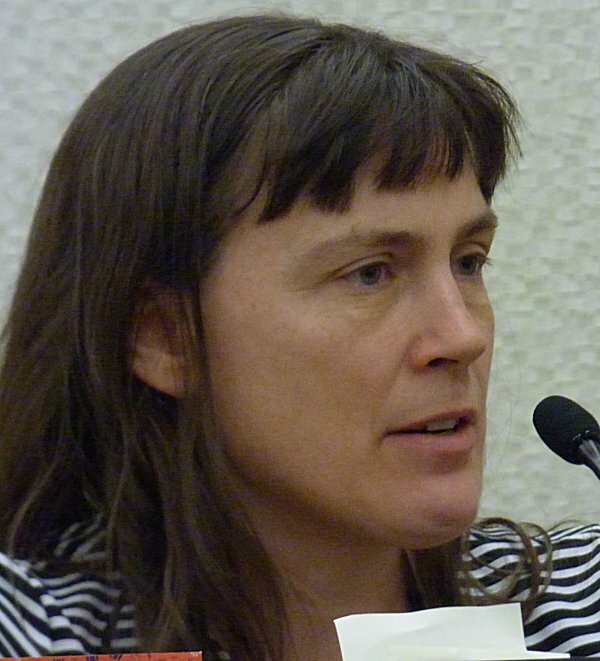 Cleeves' very first Vera Stanhope novel, The Crow Trap, was supposed to be her breakthrough book, but it was left out of the publisher's catalog. As a result, most of the copies wound up in secondhand and remainder shops. One day a person walked into the OxFam shop in Crouchend, North London, to pick up something to read while she was on holiday. She bought a copy of The Crow Trap. Who was she? The book producer for ITV-- the future home of the Vera television series! You're all sweethearts for sticking with me this long. 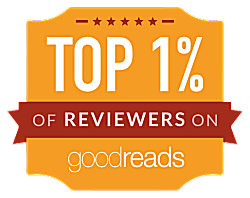 I'm going to give you a rest until next Monday when I'll share the last two days of Left Coast Crime! Wow! What a great event that must have been, Cathy! Along with everything else, you had the chance to get to some fascinating presentations and panels. I'm excited to read the rest of your adventure. Glad you enjoyed the first installment, Margo! 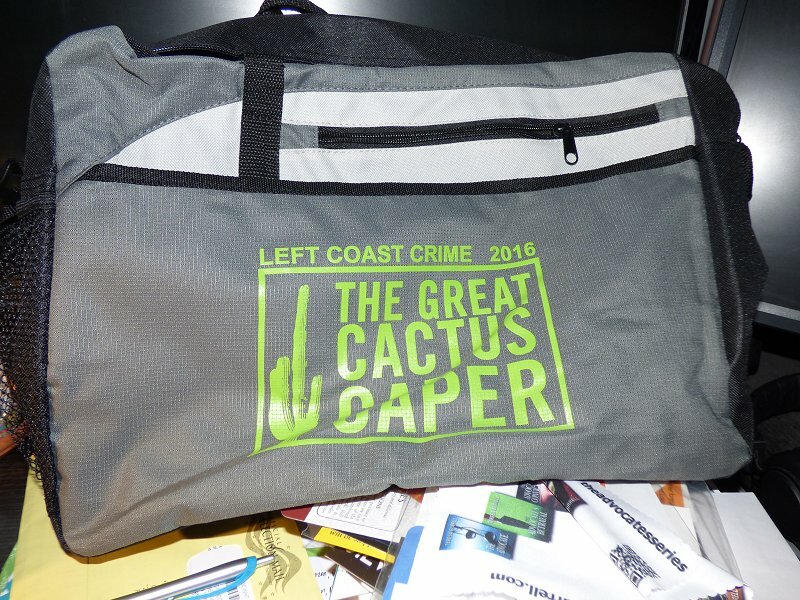 Each one of the panels lasted an hour, Lynn, and next year Left Coast Crime is going to be held in Hawaii. I love boats/ships but hate flying. Denis and I have talked about doing LCC in Hawaii a little bit, but I don't think we're going to go. Wonderful post, Cathy. I'm so enjoying reading about your adventures with Kay at LCC. Thank you for taking the trouble to share it all with us. It's my pleasure, Cath. I spent a lot of years not being able to go to these kinds of things. I know what it's like. Oh, sticking with you this long! Absolutely. Reading this is like offering chocolate to a chocoholic. I just devour it. Can't wait to read the rest of your summary of this exciting conference. 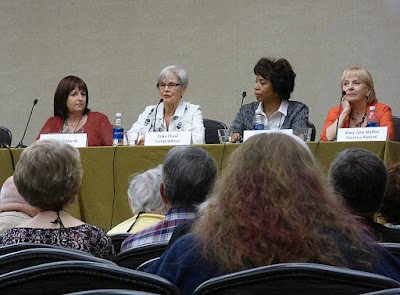 Wonderful authors and panel topics. Most of the panels I attended were recorded, but I don't know where those recordings were going to be used. Thanks for all these details! 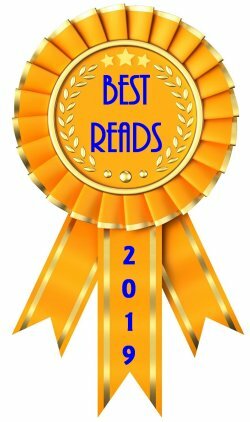 I've read Kay's side of your adventure, now yours, and I'm excited to check out the authors mentioned here that I haven't read yet. Great post! I'm glad you enjoyed my post, Rita. I know I enjoyed Kay's posts. It's always fun to read someone else's view of the same events. Hope you enjoy it, Pepper!